View a list of every Disney Full Length Animated FeatureAnimation historians love to say “It all started with a mouse”. In fact it actually began with a visionary named Walt Disney. From the early years in Kansas City with the likes of Ub Iwerks, Hugh Harmon and Rudy Ising. Walt Disney went on to become the single most important man in the history of animation. His legacy is a veritable who’s who of animated characters; Snow White, Donald Duck, Pinocchio, Alice, Bambi, Cinderella, and of course, Mickey Mouse. The Process of Animation1. A storyboard is made, all the animators and directors come together to discuss the entire film. 3. Once the story is laid out, the dialogue is recorded. This is done before animation, so the animators know what the characters will say. 4. After the dialogue is recorded, the animators can make rough sketches of just the characters. Usually these drawings are quite messy, there is still no color, or background. Some animated films have used over 50,000 individual drawings. At most animation studios, the best animators only sketched a few animation drawings, leaving gaps in between. Later on, a person called an “inbetweener” would finish the scenes, by drawing in between the areas that the animator had left. 5. 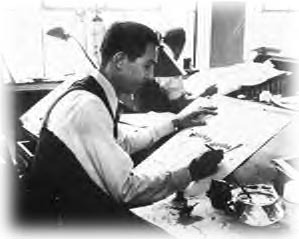 Once the entire film has been drawn on paper, the animation drawings go to the inking department. There, the inkers copy the animation drawings on to a clear celluloid acetate, sometimes called a Cel. 6. After the outline of the characters has been made, the unfinished Cel’s go to the Painting Department. The painters flip the Cel over, and paint the colors on the back. They paint on the back so the characters appear crisp, and have an outline. 8. Now all the combined elements (the Cel and the background) can be photographed. Although, the final product is not filmed with a normal projector, or camera. A special device, with a lens mounted facing down on to a table top captures each frame of the animated feature. Usually, the background is placed into a special mount, then covered with the Cel, then covered with a large piece of glass, then photographed. 9. After all the drawings have been filmed, the dialogue is added. Sometimes the film is edited at this step. 10. The animated film is released, and the general public may view it.